You don’t have to be an experienced driver or an IT specialist to use this product. Our professional solution is simple and user-friendly. Let the product do all the calculations for you. Meanwhile, concentrate on the road ahead of you and enjoy your trip. Behind the wheel. On your bike. Or simply walking. Our solution adapts to your needs and lifestyle. Do you want to navigate from A to B? Would you rather prefer a detour from the initial route? What about longer trips, with many stopovers? Tap a few times and off you go! Street-level or major roads. National or Pan-European coverage. It’s up to you! Choose from an impressive collection of points-of-interest, including restaurants, hotels and petrol stations. 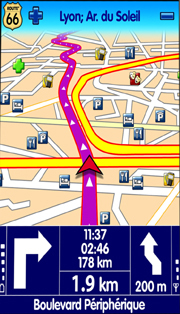 The navigation software and maps are preloaded on the device, improving the response time. Thus, you avoid data bottlenecks via slow Internet connections or poor network coverage. With Windows Mobile technology, the information is available anytime, anywhere and your experience is more personal and versatile. Start navigating now! It’s that simple!